Lock in a great price for Golden Palace Hotel – rated 8.9 by recent guests! The room was very clean and the beds were the most comfortable beds we found in Vietnam. We were close to go see Ancient Town and the staff helped us get a car in the middle of the night to go to the airport. We stayed one night and we had to leave early to catch a bus so they even packed us a bagged breakfast that was delicious! We came back to stay more nights and we would recommend this place to stay. Breakfast was amazing, the buffet style caters to anyone with various different foods. The dining area is very small though, max about 16 people. Staff were very friendly, we had fruit and juice prepared for us on arrival. Location is right in the old quarter but far enough out to avoid noise. Great location, great money for value, good breakfast served and most of importance, friendly and helpful staffs deserve to get the full marks. The staff wa very kind and the desk they were incredibly polite and helpful. We had a very late check in (almost at 3am in the morning) and they were incredibly professional. Breakfast ok.
Great location , great breakfast ,the staff are truly amazing and went above and beyond what we expected , highly recommended . Katherine at the Golden Palace booked all of our trips to Sapa, Halong bay and Tam Coc, looking after every little detail, we can’t believe how well she took care of us! She even booked a train for our trip down to the Hué. Very comfortable rooms and bed. Breakfast is good, friendly staff. Exceptional in every way. They even packed our breakfast for takeaway as we had an early morning flight! Staff very attentive! Comfortable beds, spacious well maintained bathroom, clean, nicely decorated, S U P E R friendly staff. But really, everywhere in Vietnam the people have been extremely friendly. Great location just down from a cooking school/awesome restaurant. Really good for the price! The staff was very nice and not as salesy as other similar hotels in the area. They even gave us a little plastic box for us to carry some food from the breakfast to our trip. Golden Palace Hotel This rating is a reflection of how the property compares to the industry standard when it comes to price, facilities and services available. It's based on a self-evaluation by the property. Use this rating to help choose your stay! One of our best sellers in Hanoi! 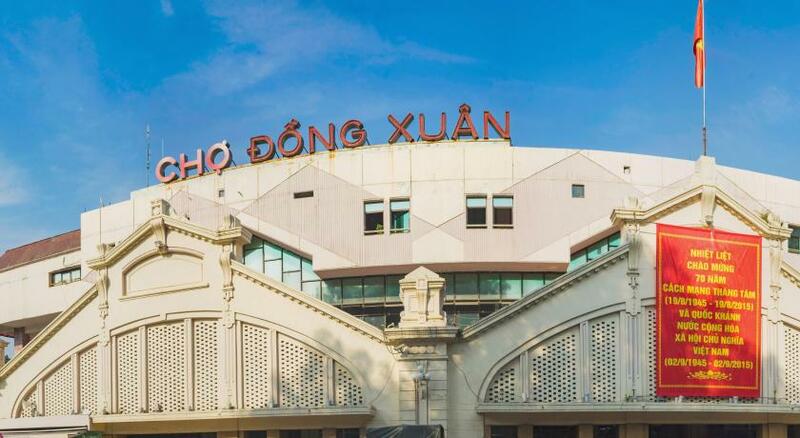 Located in a tranquil area within Hanoi’s Old Quarter, Golden Palace Hotel is within a 5-minute walk of Dong Xuan Market and Hoan Kiem Lake. Massage services, a sauna and free WiFi await guests. Luxurious and soundproofed, the rooms feature wooden flooring and come equipped with an LCD TV. The rooms feature a small working desk and a computer is provided upon request. Tea and coffee making facilities are provided. Rooms feature bathrooms with bathtubs or standing shower. Guests can rent a car or bicycle to explore the city on their own, or book a day trip at the tour desk. Currency exchange and ticketing services are also available. A local, Western or Vietnamese breakfast can be enjoyed in the restaurant. For alternative meal options, 24-hour room service is available. Golden Palace Hotel is 25 mi, or a 45-minute drive from Hanoi International Airport. There are several dining, shopping and entertainment options around the hotel. When would you like to stay at Golden Palace Hotel? Rooms are located from lower to higher floors and offer modern furniture. Bathroom facilities include a shower cabin, full amenities and linens. Please note that this room type does not have windows with natural light. A spacious room for 4 offering a luxurious bathroom with a bathtub and shower. Rooms have good view with windows overlooking the city or a private balcony that comes equipped with chairs and table. A spacious suite offering a bathroom with a shower. Room has a window that offers street views. The suite is located on the highest floors of the hotel. It features views of the city. The bathroom comes equipped with a bathtub and shower. A small 3* boutique hotel in the Old Quarter run be the family management brings you the atmosphere as being home far away from your home. You will feel always be welcomed and comfortable as a family member than a guests by hospitality attitude of host - hotel staff. House Rules Golden Palace Hotel takes special requests – add in the next step! All children under 2 years are charged VND 10 per night in a crib. All children under 16 years are charged VND 15 per night for extra beds. Golden Palace Hotel accepts these cards and reserves the right to temporarily hold an amount prior to arrival. Only 2 outlets that were hidden behind one of the beds. Initially, I got irritated and frustrated due to the misunderstanding regarding my date of arrival because they failed to check the date when I sent my flight details. They weren't expecting me until the following day hence, no car waiting for me at the airport. I called them using my international number and they couldn't get back to me because their phone can only make local calls. I had to book a Grab car going to the hotel. And as expected due to the misunderstanding, no room was available either. They admitted they're mistake and made up for it. Iris, the night shift receptionist gave me free breakfast. Daisy, the day shift receptionist told me that I can check in early for free. The receptionists are all nice and helpful especially Daisy who helped me with my Vietnamese sim card; booking of tours; and writing down on the map which areas to visit for food, etc. Rosa is also friendly. The staff at the restaurant is also nice. I just hope that there would be more variety on the breakfast buffet. All in all, my stay was more than ok even with the initial misunderstanding. I would stay there again. We were able to take a shower even after check out before tacking the night train. Also we were able to leave our luggage with them. No window in bedroom- but we were aware of this at booking, and for the price didn’t bother us too much! Very friendly staff, great location, clean & comfortable rooms, fantastic value for money. Breakfast- although we are very fussy eaters! Staff are amazing and always happy to help! The breakfast left something to be desired. The staff was very friendly and helpful. They met all of our needs while we stayed and went above and beyond when we needed help. The staff looked uninterested because they were very busy with their telephones. Toilet downstaires close to the restaurant was dirty. Our bedroom had no window which made it feel extremely claustrophobic. We weren't aware of this until after we booked. I think rooms at the front of the hotel do but the back don't. We stayed 4 or 5 nights which was too much without any natural light. Location of the hotel is very good, very close to lake and market, but with enough distance to sleep well. Our room has been cleaned very carefully, supplied with everything what tourists need (towels, soap, shampoo, toothbrush, umbrella, coffee/tea set) and prepared with high orientation to details (fresh rose petals on bed). We feel there almost like in home. Breakfast was absolutely delicious, you can choose Vietnamese or International option from many plates based on your preference. We want to greet very nice girl from reception desk, she was very helpful and give us many tips and advices for best places to visit / to eat. To sum up, we strongly recommend Golden Palace Hotel for your stay in Hanoi, we will back there for sure.